If you want to further reduce the time it takes your Windows 8 system to boot one of the most efficient options will be to automate the login process - this saves you the time you usually spend on wiping away the lock screen and entering your password. Be careful though! Not having to enter the password at startup leaves your machine vulnerable to direct access by strangers. This should not be done to portable or public machines! 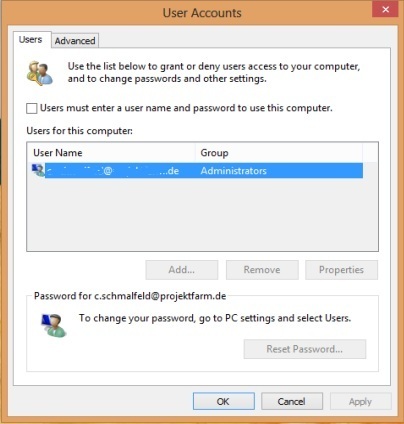 First off select the user you want to log in with automatically - then remove the Users must enter a user name and password to use this computer checkbox and apply. You'll be prompted for the account's password, so enter it and confirm once. Afterwards, the machine will log into the account automatically! How should I proceed when the box for “User must enter a user name…” is missing? Thanks for your help in advance.